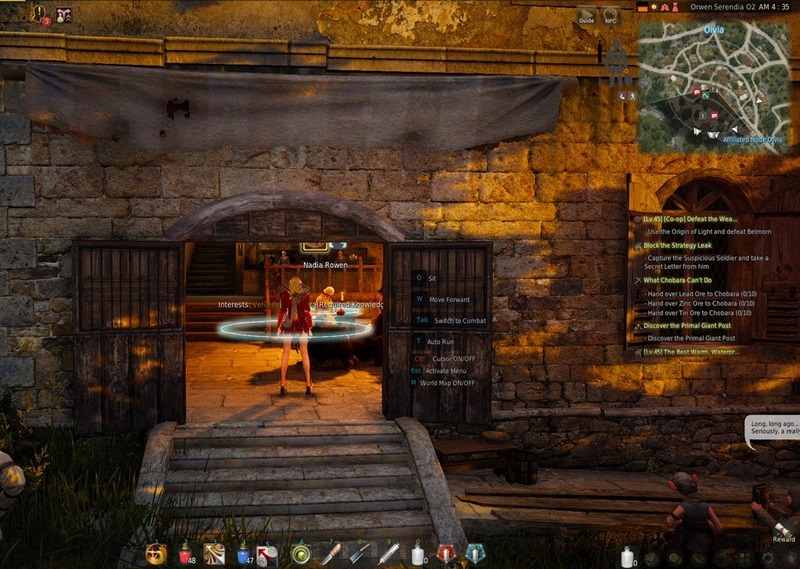 A guide to cooking in Black Desert Online with all the available cooking recipes. Updated July 7, 2016. 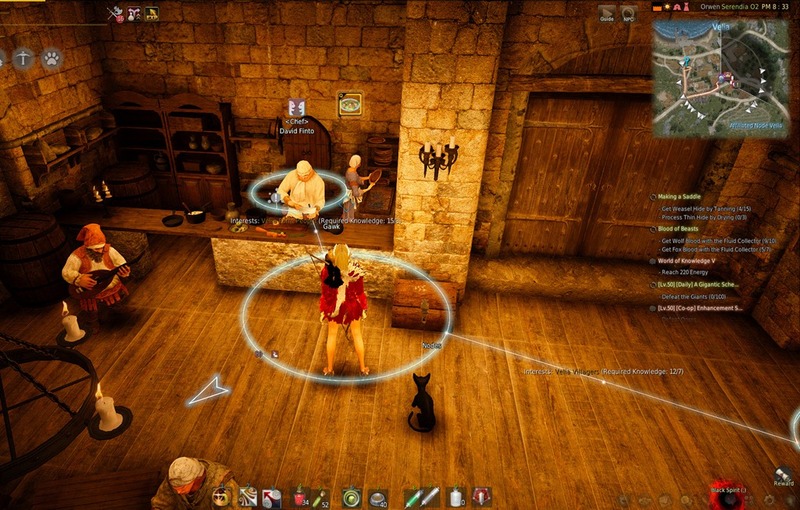 Cooking is an essential Life skill in Black Desert Online that not only enhance other Life Skills but also greatly improve your PvE/PvP experience with a whole array of foods to enhance your combat abilities. Cooking is relatively easy to pick up and many of its ingredients can be used interchangeably so there is usually no need to chase down a specific material that might be hard to obtain. Cooking associates tightly with Farming and Fishing. While you might be able to get by with purchasing ingredients off the Marketplace, it is much more reliable to get them yourself, especially if you are thinking of mass production. 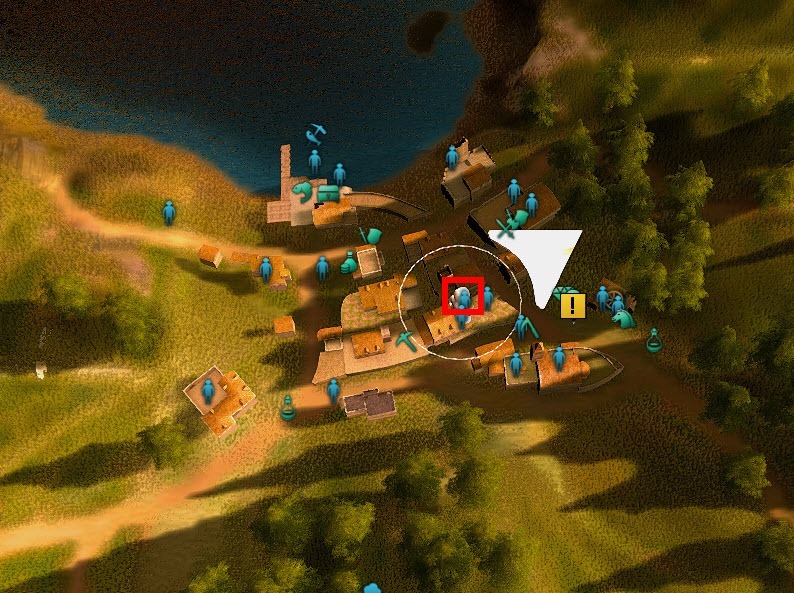 Fishing is mostly self-explanatory but for Farming you can consult the guide here. To get started on cooking all you need a Cooking Utensil purchased from a Chef (use the NPC window and select the cooking button to locate the closest chef). The basic one you can purchase from the vendors will do for now but as you level up in cooking you may want to look into better cooking utensils you can make from Tool Workshops in cities. The better ones will have higher durability, allowing you to craft more in an AFK cooking session and have faster crafting speeds. The great thing about cooking is that in most cases you can interchange ingredients as long they are of the similar type. This means that if a recipe calls for grain you can put in potato or corn and it will just work the same. If it calls for fruits apple or grapes or any other fruits will work identically. 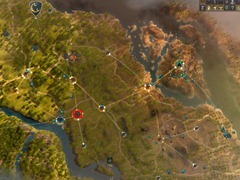 You can interchange ingredients in the same recipe as well. If a recipe calls for 4 apples for example, you can put in 2 apples and 2 grapes instead. So if a recipe calls for 5 potatoes for example, you can either put in 5 normal quality potatoes or 2 High Quality potatoes or 1 Special potato. The last basic feature to mentionis the Continuous Production button on your cooking utensil. All you need to do is put ingredients enough to make 1 batch of the food and then click on Continuous Production. This will allow the cooking utensil to continuously produce the food until it run out of ingredients. However, certain other things can also stop production such as running out of durability on the cooking utensil or running out of energy. 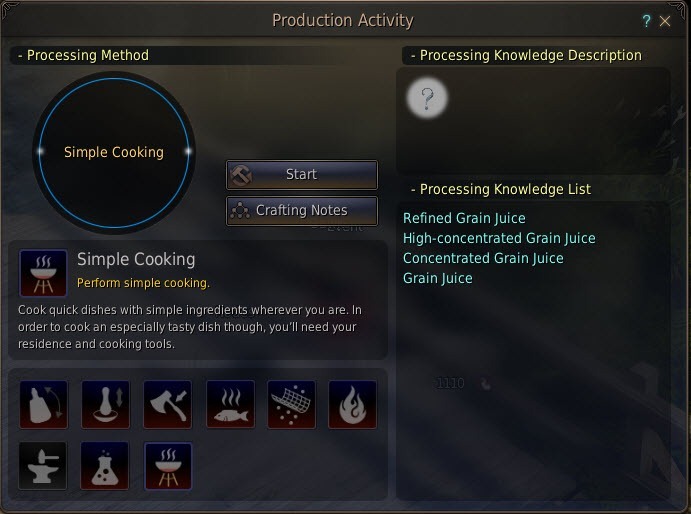 Starting at Apprentice 1, you start doing some of the cooking dailies in Velia and Olvia to raise your cooking skills (see below). Some of them won’t fully unlock until you reach Skilled. 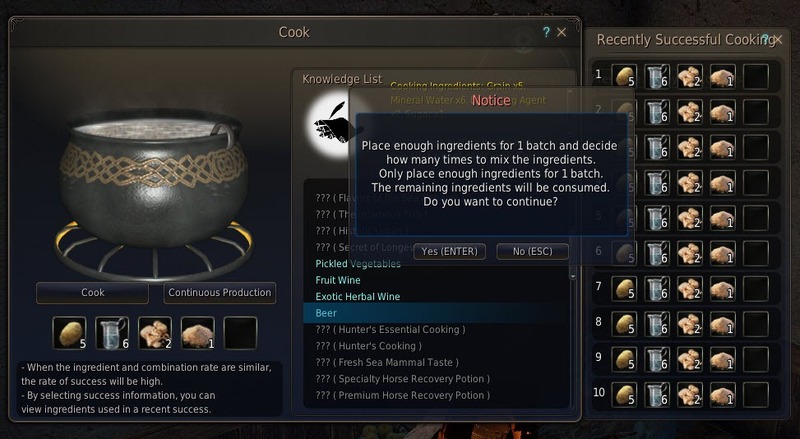 Making Beer is still a decent way to raise your cooking levels but you might want to start thinking about making Tea with Fine Scent for the Milk Tea/Sute Tea that you will be able to make once you hit Skilled in cooking. I went over the details of Tea with Fine Scent over at this guide but I will also list the recipe below for reference. Starting at Skilled 1, you can make Milk Tea/Sute Tea so hopefully you have stockpiled a bunch from the Apprentice levels for use. Once again, the details for making these two teas are covered here but for reference the recipes are as follows. 1x Salt (purchased from cooking vendor). Doing the cooking dailies mentioned below will give you a nice chunk of cooking XP per day but otherwise it is a slow road from here on out. Make whatever you feel like/need. 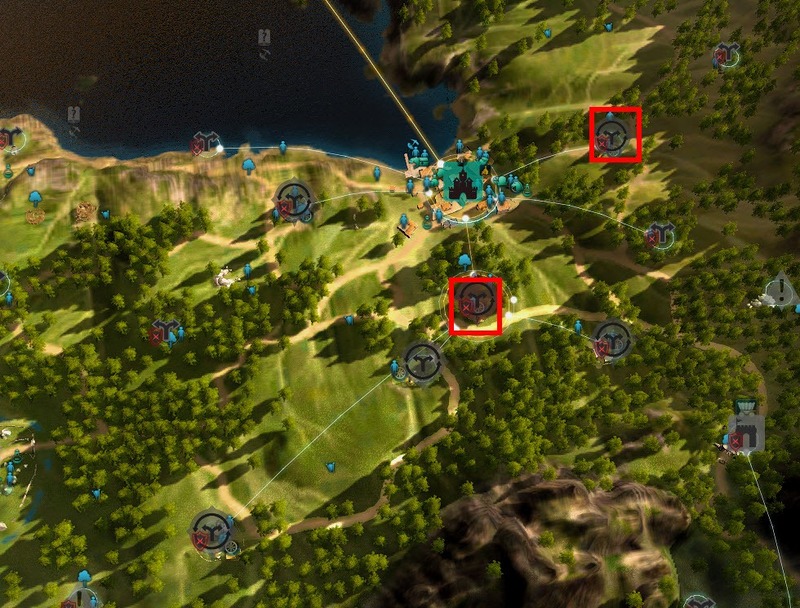 Olvia dailies unlock as you get to Beginner 10 in cooking and they are much easier to do than the Velia ones. However you do need to unlock the final one with 200 Amity with Nadia Rowen. Rewards: 70 Contribution XP, Recover 5 Energy, Cooking XP, Cool Draft Beer. Choice of 5x Onion, Garlic, Hot Pepper, or Pepper. Rewards: 70 Contribution XP, Recover 5 Energy, Cooking XP. Choice of 10x Onion, Garlic, Hot Pepper, or Pepper. Rewards: 120 Contribution XP, Recover 5 Energy, Cooking XP. Choice of 10x Strawberry or Grape. Velia Cooking dailies start to get unlocked once you get cooking Apprentice 1 but two of the later ones require Skilled 1 and Skilled 6 to complete. The dailies are from Shelley in the bottom floor of the building to the left of Igor Bartali. You must complete the quest Do You Remember How to Cook? from Shelley first to unlock them. Rewards: 70 Contrib XP, Choice of 5x Milk, Pork, Egg, Potato. Rewards: 70 Contrib XP, Choice of 10x Milk, Pork, Egg, Potato. Cooking Ingredients can be classified into several families that can be interchanged in a recipe. 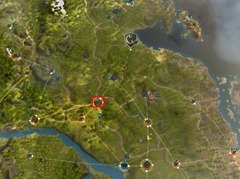 You can purchase most seeds from the Marketplace but incase there are seeds unavailable you can purchase some from the seed vendor in Calpheon, Ahr. She has the most complete seed collection out of any seed vendor. 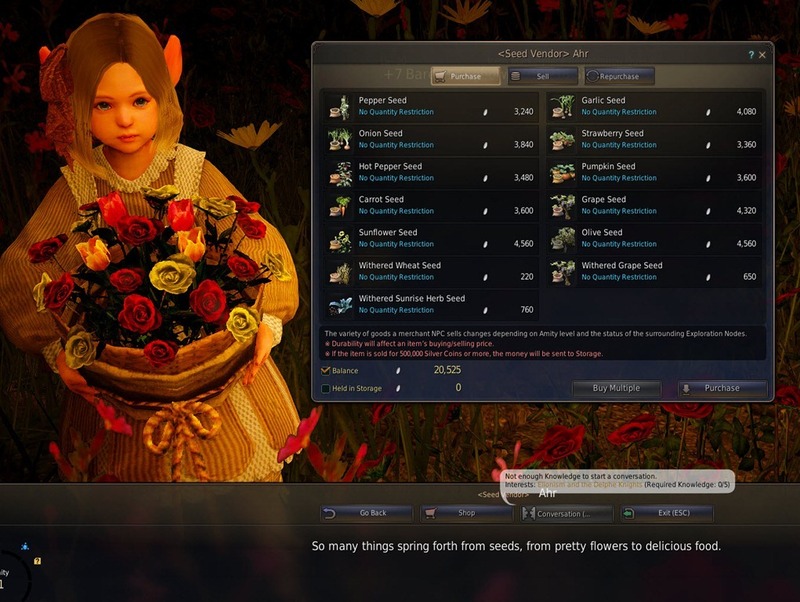 These seeds need to be planted in your garden/farm. 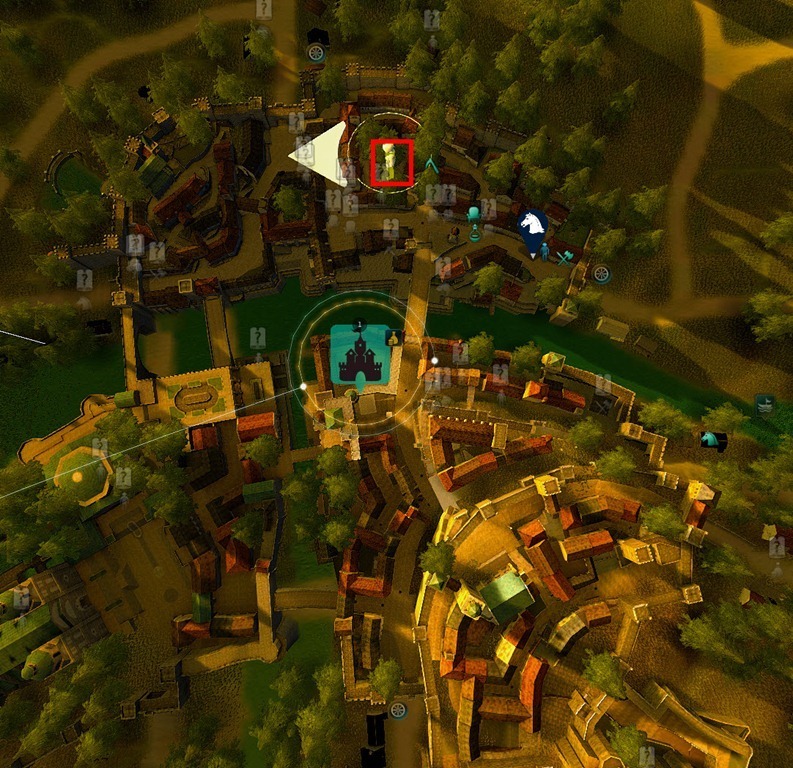 Aloe previously was a pain to gather pre-Mediah but with Mediah has become widely available. 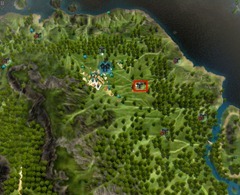 Infact there is an Aloe node right now Ahto Farm in Mediah where you can send your workers to gather it. Cooking Honey can be obtained exclusively from the Alejandro Farm node near Heidel. Eggs are a byproduct of Chicken Meat nodes. 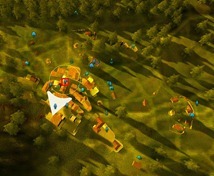 There are two nodes in Bartali and Finto farm not far from Velia. 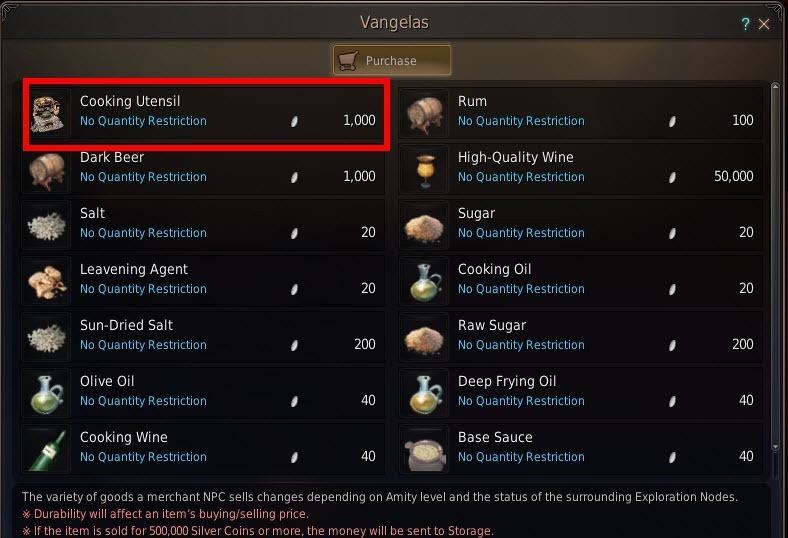 You can also get them as rewards from Velia cooking dailies and some Olvia cooking dailies. Milk is obtained by milking cows. 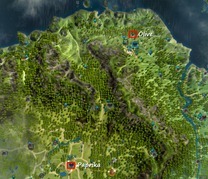 You can find cows west of Olvia, Falres Dirt Farm east of Calpheon and in Bain Farmland south of Calpheon. There are dailies by each of the farm for milking cows that will reward you with 10 milk each as well. Additionally, you can get milk by turning in one of the cooking byproducts. Out of the grain family, Potato can be gathered by workers at the Bartali Farm, Loggia Farm or the Finto Farm nodes all close to Velia. Wheat can be found in Northern Wheat Plantation (east of Calpheon), Costa Farm, and Moretti Plantation south of Heidel. 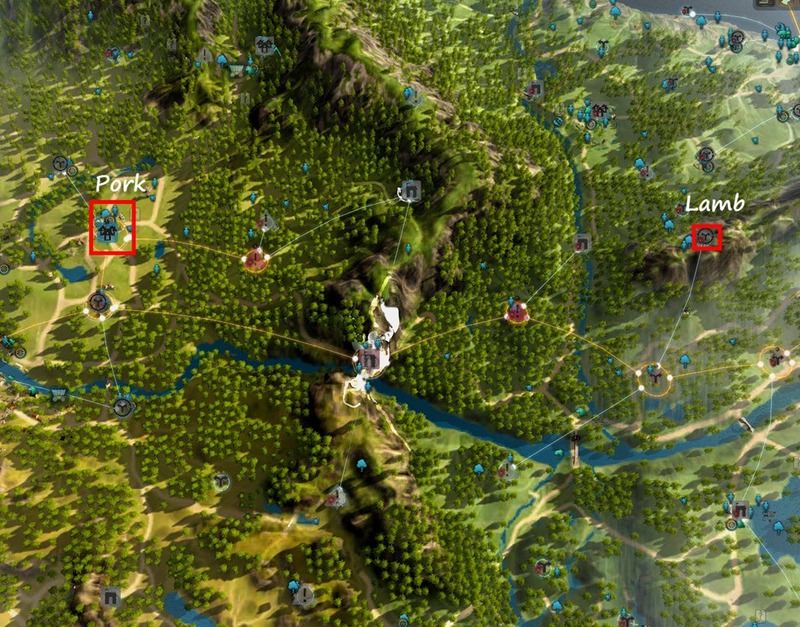 Barley can be found in Northern Wheat Plantation while Corn can be found in Toscani Farm a bit further from Velia. 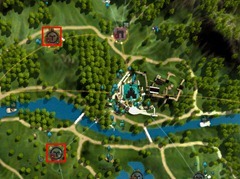 Sweet Potato can be found in Shuri Farm in Mediah. Farming wise, all have seeds taking up 1 garden slot except for Corn which take up 2 slots. Fish and Seafood are not interchangeable in a recipe. If a recipe calls for fish, you cannot substitute seafood and vice versa. 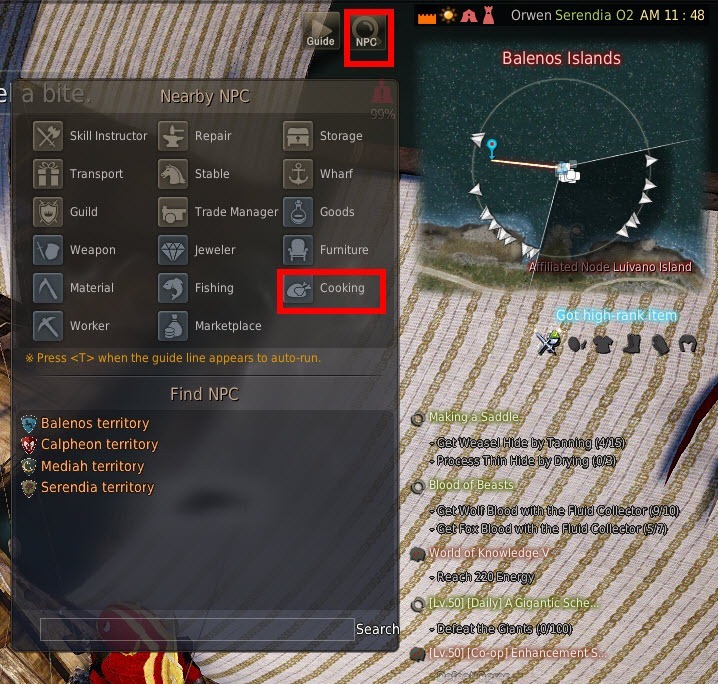 If you are looking to fish up seafood while AFK fishing, you need to uncheck the throwaway useless items button or all the seafood will be thrown out. You can dry fish/seafood via Drying under the processing (L) menu. Dried fish/seafood won’t expire but it will take twice as much in the recipe. So if a recipe calls for 1x fish, you will need to put 2x dried fish. For flowers the easiest to acquire are Sunflowers as you can mass produce them on a farm. Rose and Tulips can also be gathered manually from Northern Wheat Plantation. Out of the Fruit family, the easiest to obtain are Grapes and Strawberry. Apples can be only picked off Apple Trees in the wild and the rest are solely from a special vendor in Capheon (Milano Belucci). 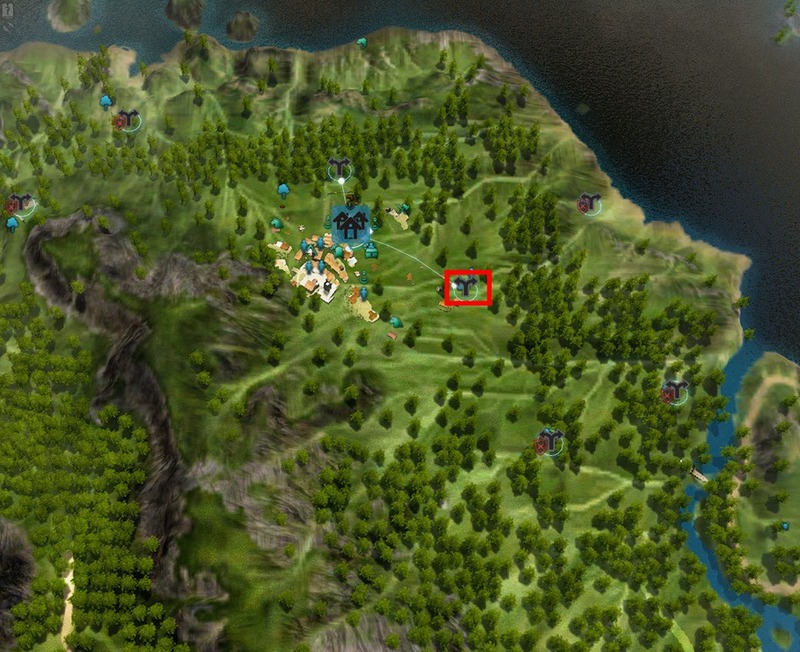 Grapes can be gathered from the Casta Farm node just east of Olvia. 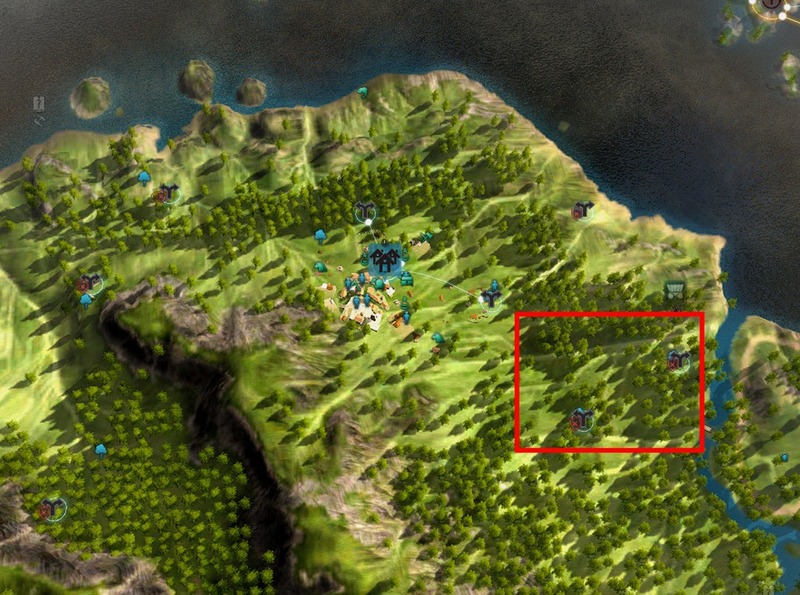 Farm wise grapes take up 2 garden slots so it is not the best for farming. Strawberry would be a better choice since it only takes up 1 slot. For cooking, meat are divided into three categories: regular meat, bird meat, reptile meat. They can’t be interchanged with each other so you cannot use bird meat when a recipe asks for regular meat. Deer, Lamb, Fox, Rhino, Pork, Beef, Raccoon, Weasel, Bear, Wolf. Lamb, Pork, Fox and Wolf Meat are usually the easiest to acquire. 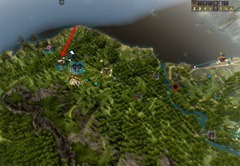 Lamb can be acquired from the sheep in Lynch Ranch while pork can be acquired from the boars around Northern Wheat Plantation.Fox and Wolf meat can be obtained from the area east of Olvia. Pork is also one of the reward choices from the cooking dailies in Velia. The easiest to acquire is Chicken Meat. 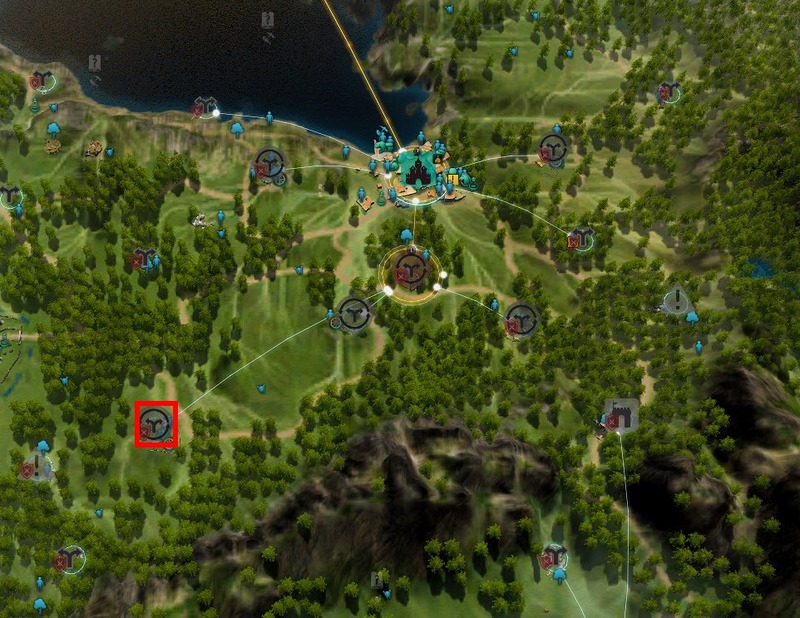 There are nodes for it at both Bartali and Finto Farm near Velia. Your workers at the Chicken Meat node will also produce Eggs, which is in high demand. 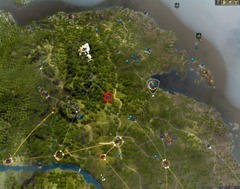 Lizards can be found in the swamps around Glish. 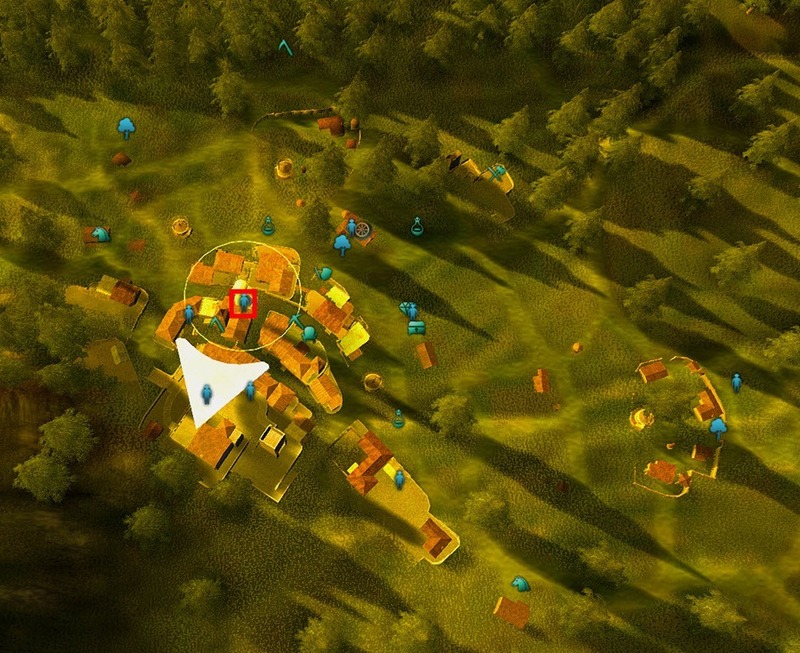 Waragon can be found underground near Northern Wheat Plantation. 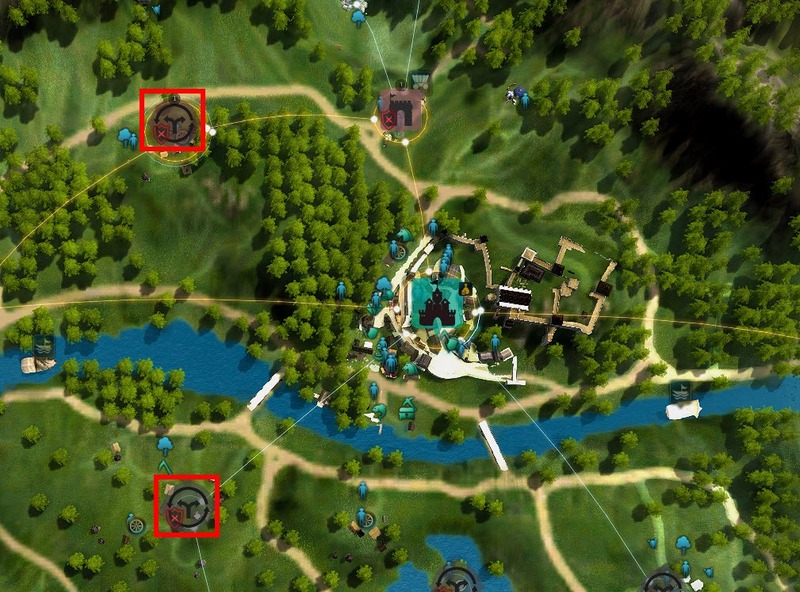 Cheetah Dragons are found in Mediah. Spices here includes Garlic, Onion, Pepper, Hot Pepper, and Cinnamon. 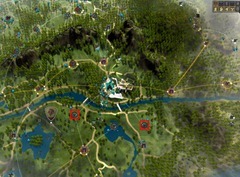 With the exception of Cinnamon, which is a Mediah addition, the other spices cannot be obtained from nodes and must be acquired from farming/gardening. 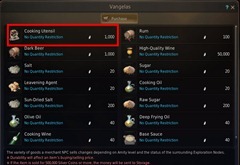 Olvia cooking dailies do reward them as well but you are limited to 15/day. 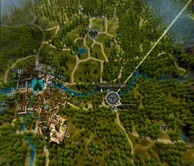 Cinnamon can be acquired from the Kasula Farm node right next to Tarif. Olive, Paprika, and Pumpkin can be acquired from nodes. 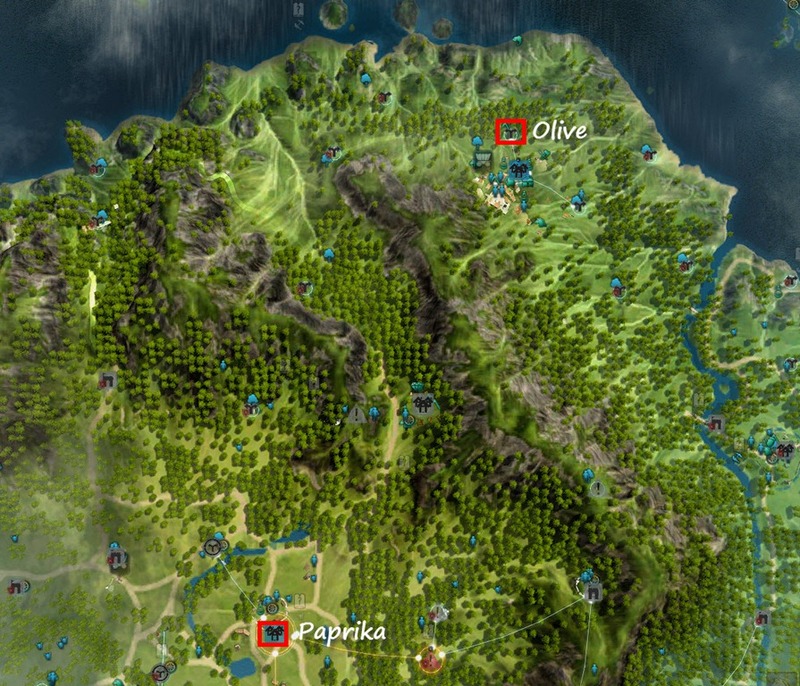 Olive can be acquired from Wale Farm node just north of Olvia while Paprika can be acquired from Northern Wheat Plantation. 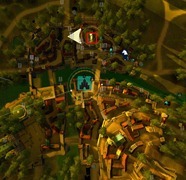 Pumpkins are acquired from Alejandro Farm and Costa Farm west of Heidel. Olive/Paprika/Pumpkin/Tomato can all be grown on a farm as well. All except for Pumpkin takes up 2 garden spaces. Much like Simple Alchemy, Simple Cooking allow you to make Grain Juices that act as HP potions. The top tier grain juices you can make is even better than the best HP potion you can make and they weigh a lot less. You do not need to use a cooking utensil to use Simple Cooking. It can be done with the Production Activity window (L). All it needs is 3 Grain and 1 Mineral Water for every Grain Juice you want to make. Since you cannot split stacks in Simple Cooking, you just move your character when you want to stop or it will go on until you are over the weight limit. It no longer cost energy to do Simple Cooking so energy issues are no longer a concern. To make better grain juices, you can either place 3 of the lower tier grain juice into simple cooking to make 1 higher tier or use the mass production method where you can 30 of the lower tier grain juice and 1 sugar to make 10 of the higher tier. Much like alchemy, cooking produces byproducts you can turn in for milk, beer, coins, cooking XP or contribution points. 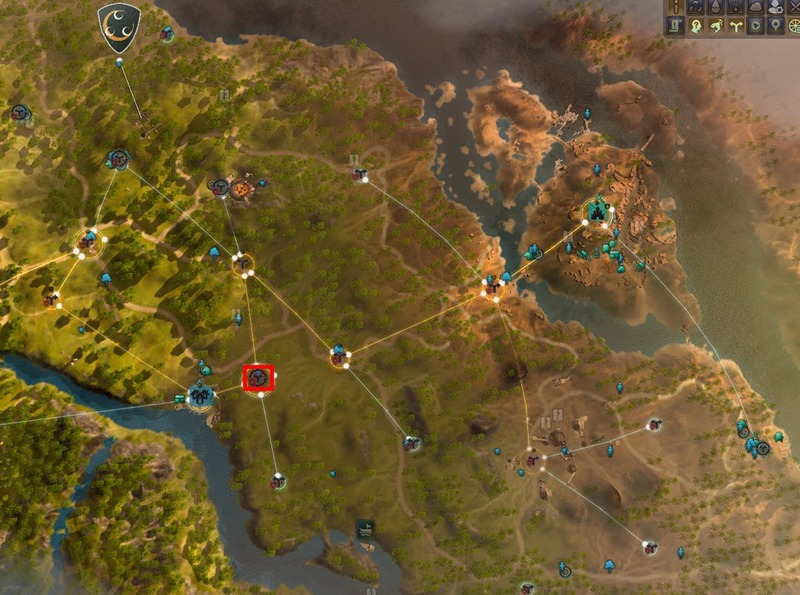 There are 5 different kinds of byproducts that you can hand in to NPCs around Heidel. 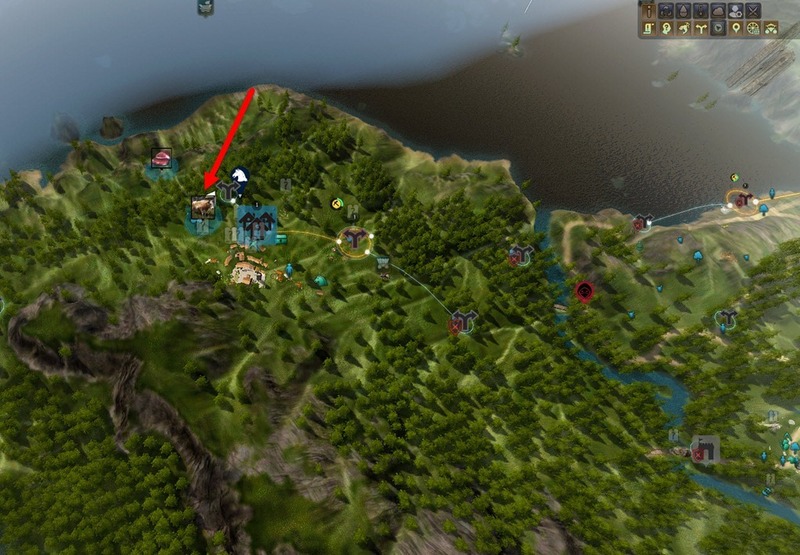 4x Pepper Life EXP +10/15% for 75/90 min. +8 Evasion for 75/90 min. 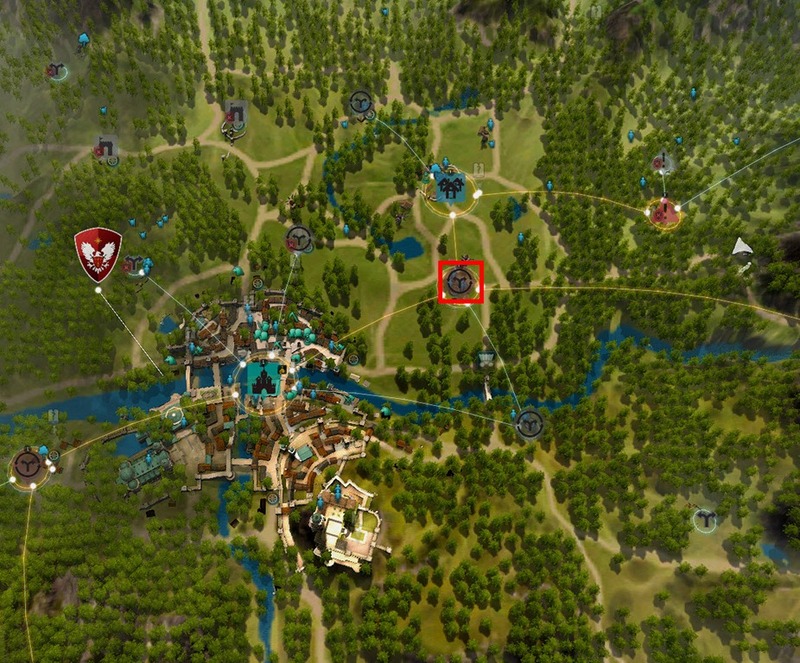 2x Olive Oil Chance of obtaining resources by gathering +3% for 60 min. 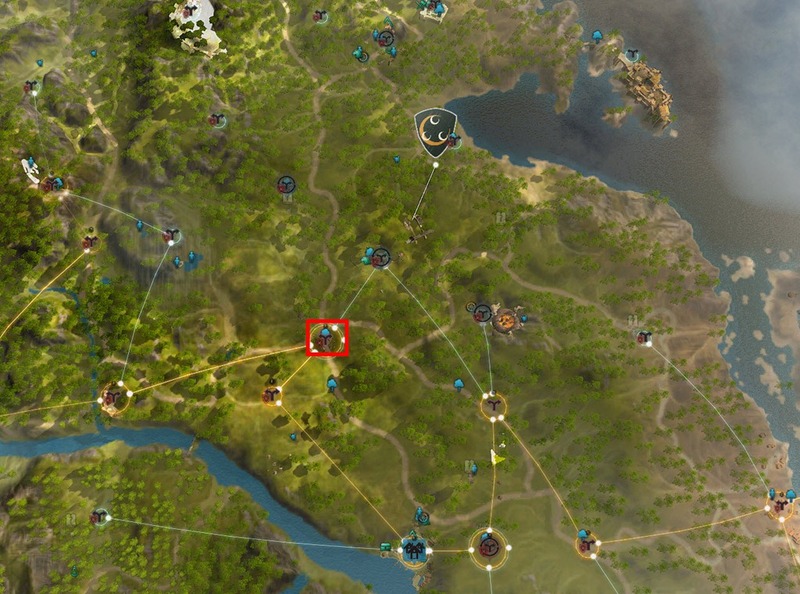 2x Salt Processing success chance +3% for 90 min. 4x Vegetables Processing success chance +5% for 110 min. 2x Leavening Agent Cookng/Alchemy Time –3% for 30 min. 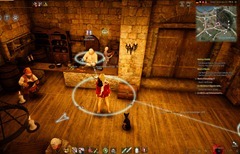 3x Red Sauce Cookng/Alchemy Time –5% for 110 min. These specials require multiple food to make but grant you various buffs. There are several items that can enhance your cooking experience. 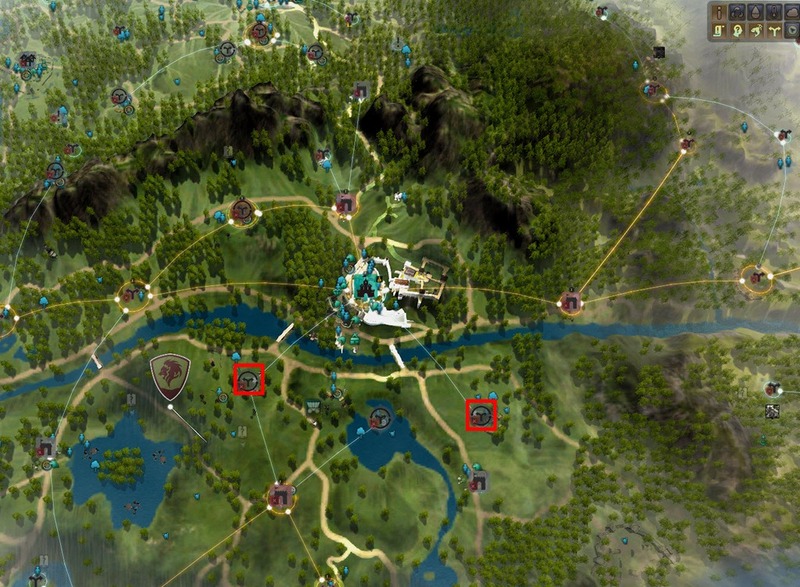 Make sure you are using the Sute Tea you are making for that 8% more cooking XP. This will stack with the clothes and costumes for a total of 33% more cooking XP. You can only wear one of the clothes. It goes into your armor slot. Cook’s Clothes – Cooking XP +10%, requires Cooking Skilled 10 to wear. This is rewarded once you reach Professional in Cooking. 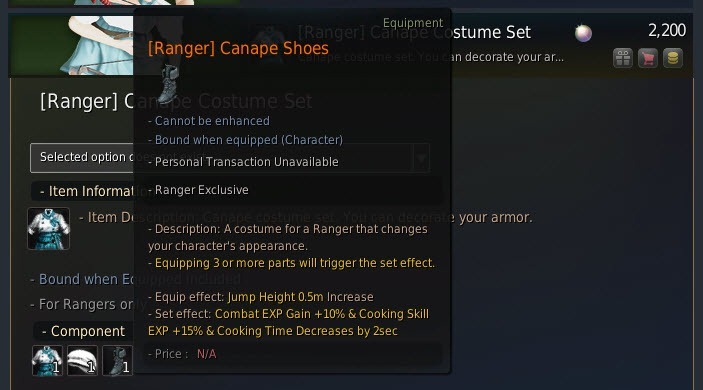 The Canape costume from the Pearl Store will give you 15% Cooking XP and decrease your cooking time by 2s. This is a set effect so you have to wear all 3 pieces of the Canape costume to get the effect. 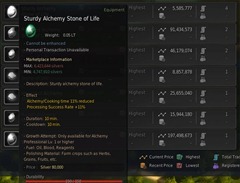 If you happen to get the Alchemy Stone of Life, they will decrease your cooking time. 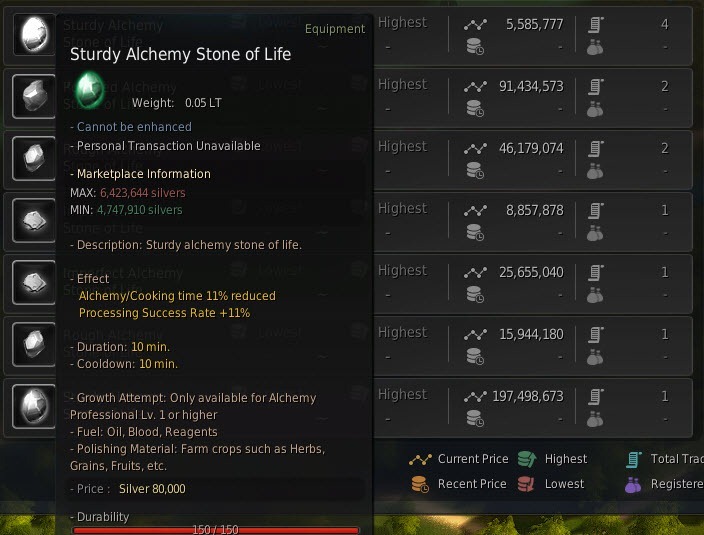 The % decrease depends on the tier of alchemy stone with the top tier giving you a 25% decrease (more realistically you are looking at the most 11% as the top tier ones are extremely hard to obtain). First table in the “simple cooking” section, typo “gain” instead of grain 🙂 excellent guide so far though as usual. 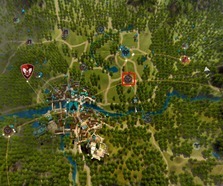 Thanks for keeping up with the guides for this game! It’s great how you gather everything useful into one clear, easy to read page, so I don’t have to have 2-10 pages opened at the same time like on some other BDO sites for recipes etc. 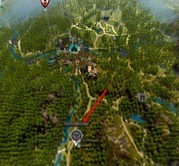 This guide says nothing about chaining 3000 beer crafts to fast level to pro 7 to pass the most amazing woman in the world. Are spices interchangeable too like grain, fruit etc? Butter should be made by shaking Cream with Salt (http://bddatabase.net/us/item/9063/). Couscous requires Teff Flour Dough, not generic interchangeable dough. Valencian Meal (not special) requires 2 date palm wine, not 2 date palms. YEP wrong on 2 different sites. Annoying. ingore this, ima tard, its Couscous, got mixed up cross referencing multiple data sources. Ok I’m asking cause I can’t find it anywhere..what is teff and how do you get it? Teff is from the famrhouses around Valencia City mostly, have a worker gather it. The list of materials to make Couscous needs a slight correction. Couscous can only be made with Teff Dough. Potato, Wheat, Corn, Barley or Sweet Potato Dough won’t work. Having it listed simply as “dough” infers the latter versions. 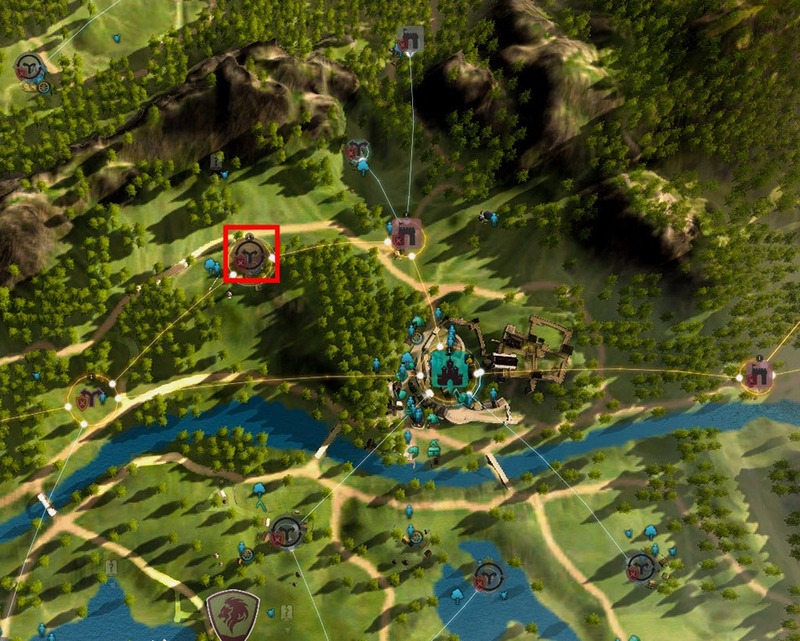 There’s no cooking dailies past Velia, for instance in Calpheon? I am at Pro 9 and the EXP I get from Olvia and Velia is really not worth the time anymore except for some contribution. 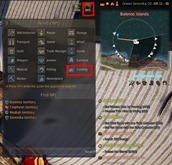 I really hope you will update this guide! Just wondering if you were going to update cooking? 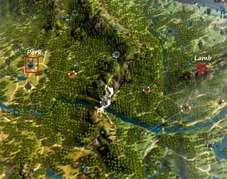 Lots has changed since your last update. I hope you do, and thank you!! How do you change the number of ingredients in the recipe in accordance to it’s tier (green, blue) if the number of white ingredient required is 1? You can’t if it only requires 1 white. Only works for those that requires more than 1. In the “Simple Cooking” section, you could add Star Anise Tea. Star Anise Mushrooms and Purified Water. EDIT: Star Anise from the tree, not the mushrooms. 1 star anise and purified water each per tea. 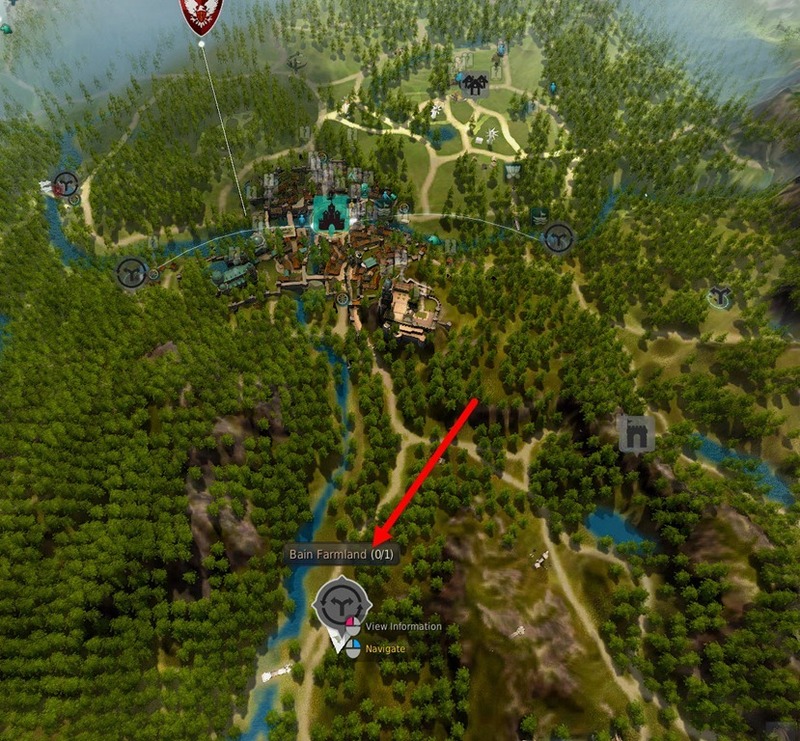 You can also find free Grapes just outside of Velia coming from the direction of Logia Farm/the dueling arena. About a dozen vines in two rows. I can’t seem to trigger the daily cooking quest. 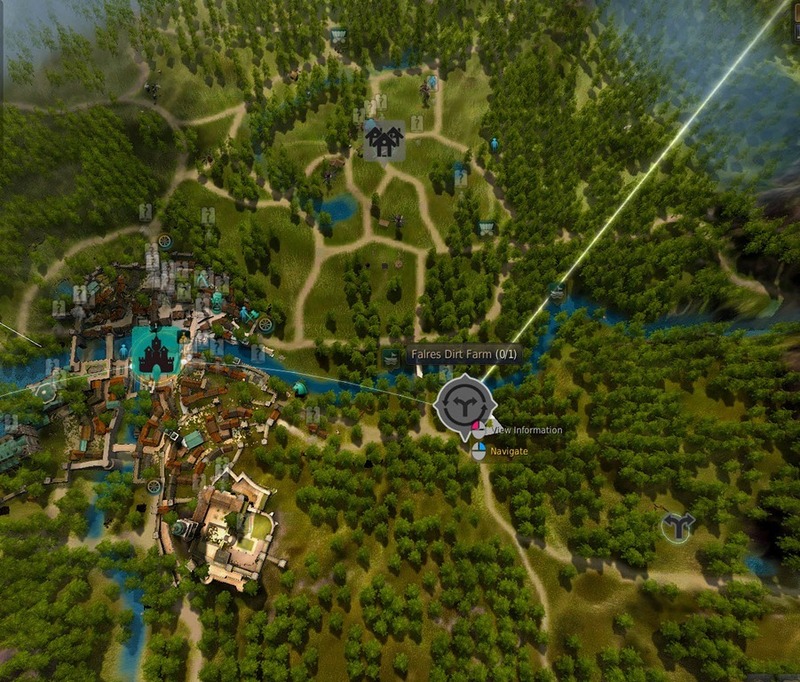 I have the amity and am Apprentice 10 but Nadia only offers the waterpark quest. What am I doing wrong? There’s a little mistake in the Assorted Side Dishes recipe. It uses 2 Seafood, not 1, though with Professional 6 I get around 40% success with just 1 seafood or its dried equivalent. NEW FOOD RECIPES!! USING CHICKEN!! 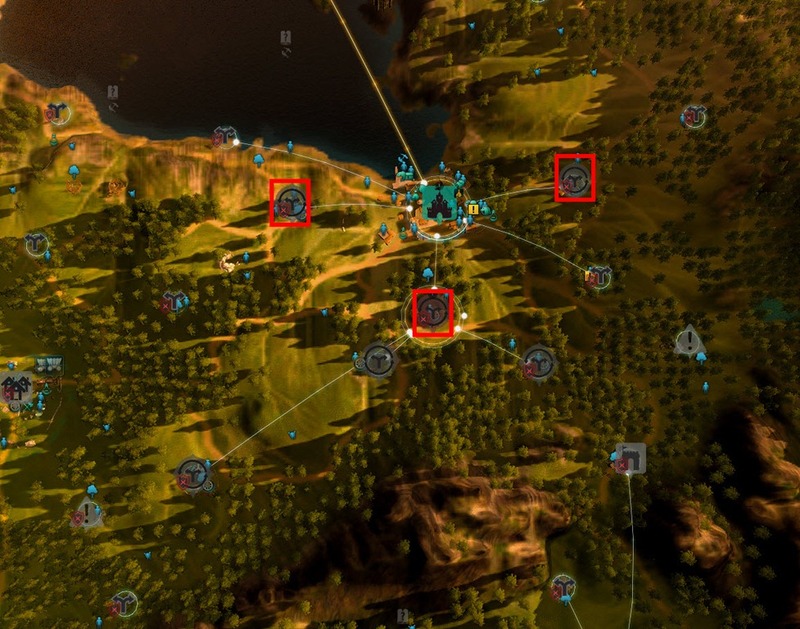 Finally a reason to use the chicken farms. 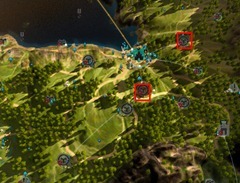 Either the Velia Dailies have been taken away, or they are level-capped. I’m Cooking Professional 10 and just found out about these dailies, yet when I talked to Shelley there were no quests available for me – neither the dailies nor the “Do You Remember How To Cook?” quest. Thanks for the reply. I’ll check it when I’m home. Seems like I have to reset it to “All” after every update. Dark Pudding can use Llama blood. How the hell do you cook?